Hydro Excavation; Better, Faster, Cheaper Compared to Traditional Digging. 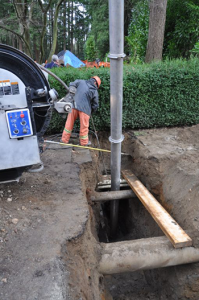 Hydro Excavation is a fast and safe method of exposing underground utilities. One of the greatest benefits of using hydro-excavation over other typical forms of excavation is its ability to safely and quickly “dig” in areas where other utilities might be present, without risk of interruption and/or damage to these systems, or injury to workers and others. Hydro excavation is also called “potholing” or “daylighting”. The procedure involves blasting the soil to be removed with a high-pressure water jet, breaking it up and mixing it with the liquid. The resulting slurry is removed quickly by vacuum, and contained in the truck for appropriate disposal. It’s a pretty simple procedure, and for an experienced technician quite quick and easy to execute. Utility companies pioneered the hydro excavation technique because it allowed them to easily locate existing services without damaging them, and install new services quickly and safely. Unlike conventional digging, there’s no danger of destroying an existing service line when digging and destroying it. Landscapers and other contractors adopted the technology because it’s very targeted – it allows you to pinpoint the location of your excavation with minimal damage to adjacent property. Hydro excavation is ideal for stump removal, drilling of postholes, and installation of landscaping features like ponds and man-made streams. Because hydro excavation is relatively “hands off”, it is safer for the workers involved in your project, and it can be used year-round, using hot water when the earth is frozen in winter. Whether you have an excavation project in Vancouver, Aldergrove, Surrey, Langley, Buranby, New Westminster, Delta or White rock, forego the backhoe and go with Hydro Excavation. Contact Edenflo Pump Truck Services at 604-575-1414 and find out how hydro excavation is the best option to get it done, quickly and efficiently. This entry was posted in Edenflo Pump Truck Services, Hydro Excavation and Flushing and tagged abbotsford backhoe service, Abbotsford Hydro Excavation, aldergrove backhoe service, Aldergrove hydro excavation, burnaby backhoe service, Burnaby Hydro Excavation, daylighting vancouver, Delta backhoe service, Hydro excavation services Delta, langley backhoe service, Langley hydro excavation, New Westminster hydro excavation service, poholing Vancouver, surrey backhoe service, Surrey hydro excavation, surrey hydro excavation service, Vancouver Backhoe service, White Rock backhoe service on June 24, 2018 by Edenflo.